… and I have, I have! My mother always used to say ‘feed a cold and starve a fever’ so I’ve been doing just that. I’m sure she’d be proud of me doing what I was told for once (I never used to, trust me!). I’ve been baking bread and the odd cake or two this month – well, what else is January for – but lately there have been frequent journeys of bread and cake right into my mouth! How did that happen? Usually I can have just a wee taste then pass them by. I blame my cold – again! This cold has a lot to answer for. Next year I think I might hibernate. How to Make Bread by Emmanuel Hadjiandreou is a book I’ve had on my shelf for ages. I have read it. Emmanuel Hadjiandreou makes bread in a slightly different way to the way I’ve been used to. The ‘kneading’ is not the workout it usually feels like for me – it’s more like folding. Could this possibly work? I decided the time had come to give it a whirl. There are step-by-step pictures so impossible to go wrong. Hopefully. The first recipe in the book is for a small loaf with three flour options – white, malthouse and wholemeal. 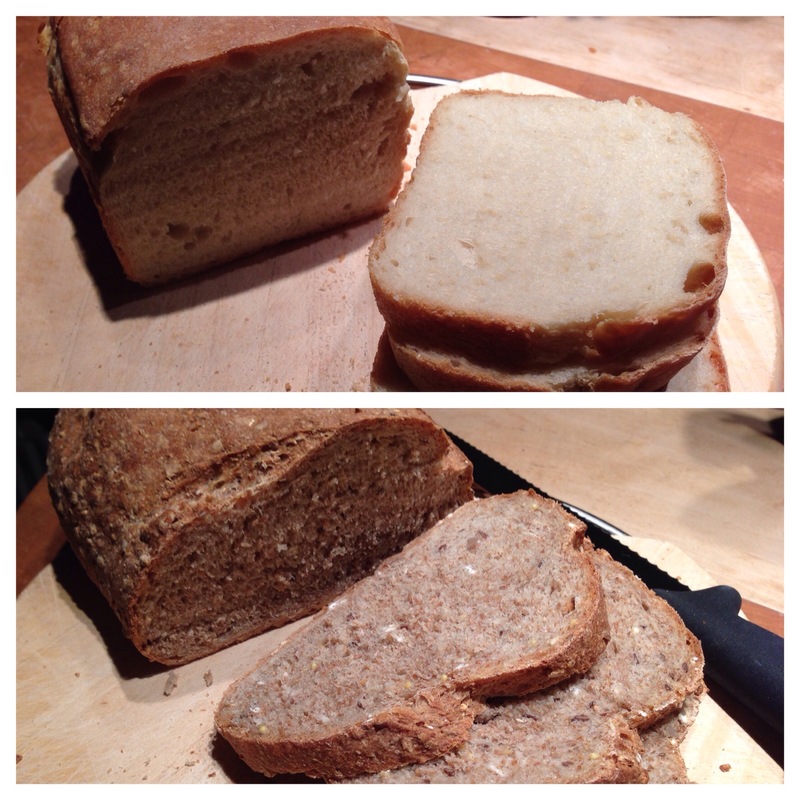 The top picture is of the white loaf (first attempt) which was really good in texture and taste. The second picture is of the malthouse loaf but I ran out of the granary-style flour so I made up the quantity with strong white flour. I also doubled the quantity because I wanted a larger slice of bread. Yes, I know, greedy. I had already made the small size loaf which turned out perfectly, just like this one did! Do I sound surprised? You bet! I’ve never had such success with bread before! And whilst I’m sure I could do with the workout, I’ve never made bread so regularly. This book hasn’t moved back to the shelf and what’s more, it isn’t going to either! Emmanuel Hadjiandreou – thank you! This entry was posted in baking, bread, Emmanuel Hadjiandreou, vegetarian and tagged bread, Emmanuel Hadjiandreou, vegetarian. Bookmark the permalink.